I have been travel blogging for years. I do it for a couple reasons. The first is that I enjoy sharing my experiences with others. I feel so lucky to have had some amazing travel experiences over the past ten years, and I wouldn’t have been able to do that without others sharing with me via blog posts, Flyertalk, and Twitter. The other reason is selfish: I enjoy reading old posts to see what I was thinking at the time and what was going on in my head. The posts have turned into a diary; they let me re-live slices of my life. When perusing through them, I’ve found that every post typically comes from one of two perspectives: traveling for pleasure with my wife and/or extended family or traveling for business. Thanks to the birth of our son, I get to write my first series of posts from a new perspective: a parent. In any case, we decided on Hong Kong, Seoul, and Honolulu. , which folds up as overhead luggage (yes – it’s awesome). I was pulling a rollaboard carry-on with airplane clothes, baby toys, and a couple days of supplies in case our baggage got temporarily misplaced. We made our way down to gate A6, and it was a pretty simple process. Despite the fact that our son refused to take a small nap in the lounge on his schedule, he still was in a pretty chipper mood. I showed him the airplanes, explained to him that we were going to have a long flight over the ocean, etc. Of course, I should have put quotations around the word “explain” as the kid is only five months old, but hey – just trying to keep him abreast of the situation! The plane we boarded was a 777-300ER in a two cabin configuration. Our trip was booked last minute, and I was surprised that I didn’t know in advance it would only be a two cabin plane. Considering how much I’d love to try Cathay Pacific First Class, I’ll admit that I felt some satisfaction not having to pass the better cabin on the way to our seats :-). I have bad case of FOMO…. Speaking of our seats, we booked 20G and 20D. These are bulkhead business class seats in the middle of the plane. They’re close to the bathroom and galley. There’s a closet to the side of one. There’s not a window within eyeshot. Why on earth would we choose these wretched seats?! Shouldn’t we be closer to the front? How about a window so we can see that beautiful approach into Hong Kong? Well, these bulkhead business class seats are baby friendly, as they have bassinets that can attach! Zachary would get his own bed. We were nervous at first when we got to the seats, as his bed wasn’t there, but they told us they would install it after takeoff. Sweet. There are actually some button snaps that the bassinet snaps into. for an extended period of time, but I can tell you that after seeing it go into the overhead bin easily, it literally just needs to not break or jam and I’ll probably extol its virtues. The flight attendants came around to make funny faces at our baby, and he gave them all big smiles back. Being fourteen hours of airtime, I had no false pretense that everyone getting off on the right foot early on meant long term success, but I was glad to see that the crew was baby friendly and that our baby was crew friendly. In terms of pre departure beverages, I had a champagne. Katy had OJ. Again, this pre-departure beverage felt different than my previous plane libations. Normally Katy and I browse the in-flight menu, have some cocktails, and discuss the fun things we might do in the air. This time I drank my champagne with the attitude of “you bet I need a freaking drink. I’m two deep from the lounge already, and anything to make this go a bit smoother sounds great!” And instead of Katy and I exploring our seats and discussing the menu, we were passing Zach back and forth, doing our best to keep him happy and entertained, which I’m happy to say worked just fine! Of course while we were doing this, we did start noticing the features of the seat. The Cathay Pacific 777-300ER business class seats are in a reverse herringbone 1-2-1 configuration, and they recline to be 180 degree flat beds. There’s also a LOT of storage. A pet peeve of mine with a lot of premium cabins is that there is no storage for takeoff and landing. These seats have a footrest that you can put a backpack under as well as a storage area built into the side of the seat. , and it just felt wrong to have missed out on this classic horror so I gave it a whirl! Take off was smooth. The bassinet wasn’t yet installed, and they actually have a funny seatbelt attachment that they want you to put on the baby while taking off. I wish I had a picture of it, but it looks like a lasso version of an extension unit for obsese people. While it doesn’t seem like it would offer much protection, I could see it helping in the case of an unexpected lurch forward or something like that. One of the flight attendants immediately installed his bassinet, and it’s a pretty cool little unit! I love the baby sized pillow in there :-). Zach doesn’t sleep with pillows yet, but I love that it exists. We put him down in there, and he slept without a peep for all fourteen hours. Yeah.. Right… I wish! Haha we tried to put the baby down, but he resisted his nap, making a few squeaks and squeals. I can handle squeaks and squeals. I just didn’t want him to erupt into crying and piss off the whole cabin. We passed the baby back and forth for the first hour or so of the flight, and it worked well. I think it was some pretty good parenting teamwork as we actually both got to watch movies! Meal service was about to begin, and Katy chose the stir-fried prawns. I figured I would have plenty of that over the next week so I decided to give the beef a shot, having seen from Brad that Cathay knows how to cook a steak. Zachary was still with us and present for our nuts and initial beverages. Again, I made sure to have another glass of champagne to just keep the liquid confidence high and reduce my sensitivity to nonsense. 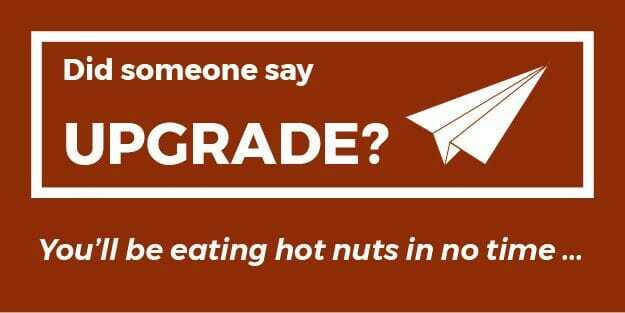 Warm nuts… one of the few things United Airlines does better than the rest! We tried to put the baby down for our main course. Since he had skipped so many naps, he was pretty tired and fell asleep right away. We were able to enjoy our meals! In terms of the service, I felt that it was very process oriented and efficient, not super personal, but I think that’s one of the main differences between international first class and international business class. Business class is all about having an awesome seat and a good meal, not about being treated like you’re in a floating combination of five start hotel and restaurant. The salmon appetizer was good. The bread was good. The salad was okay. Everything was pretty good, and nothing blew my mind. The same was true of the main courses. I had beef. Katy’s stir-fried prawns looked good, and she finished it all. My beef was pretty good, and it was actually cooked somewhere in between rare and medium rare, which I consider AWESOME for a plane. Well done, Cathay Pacific! Although this wasn’t the first time I have had properly cooked meat on a plane before. Just less than a year ago, I had it on Korean Air. If I’m flying United, though, I’d rather have their vegetarian dish than experiment with beef. As we started to wrap up the main course, Zach started to decide he didn’t actually feel like napping. Oh well. He was still fairly easily entertained, despite being sleep deprived, and his resistance to sleep led me to eat my cheesecake while hovering over his bassinet, instead of in my seat. Again, the teamwork here worked out well. I worked on him while Katy wrapped up her movie. I skipped the cheese plate. I guess I’m just a cheese liker, rather than a cheese lover. As meal service wrapped up, we continued to play with Zachary, and we could tell he was getting more and more tired as his mainland bed time of around 6:30PM drew near. Katy and I took turns changing into pajamas, she fed the baby, and then she tried to put him down. At this point, it worked! He seemed to pretty immediately enter a deep sleep. Well, it seemed deep at the time, but time would tell how deep this sleep actually was. Some post-dessert chocolates… Why not? Coincidentally, I had wrapped up the Exorcist. I do enjoy old school horror movies. I love how they typically try to scare you with a scary topic and setting, rather than excessive gore or a whole bunch of things jumping out at you from every corner. Zachary was asleep. Our meals were consumed. We had both watched a movie. Wow. So far so good! This whole process did let me find some other features of the Cathay seat that might be useful for other baby travelers. While I initially complained about the tray table size, the fact that it was so small made it very easy to move it back and forth to pass the baby around. Additionally, many tray tables “lock” you into the seat. This is the case even with some of the international first class cabins. The Cathay seat is wide, and with the tray table being small, it’s easy to get in and out of the seat even with the tray table open. Time for us adults to get some sleep while Zachary permitted. Our seats converted into flat beds, and we both went for a sleep. The flight is at a bit of an odd time. Leaving at 1:30PM, how sleepy could I really be after our lunch time meal? Based on my iPhone timer, 90 minutes sleepy. That’s how. Katy and I both popped up after 90 minutes when we heard our baby make some noise. Katy employed the scientific method of baby calming known as “reinsertion of pacifier into baby’s mouth” and that problem was solved. In terms of me, I was awake though. Back home it wasn’t anywhere near my bed time, and I already had a 90 minute nap. Katy went back to sleep. I started to write this blog post and catch up on some podcasts. I got hungry again… I had to make a tough decision. I checked their snack service menu. Do I get some Haagen Dazs ice cream? Personally, I’m a Ben & Jerry’s guy. After my deep thought about which ice cream flavor might be best, I actually decided to go with the wonton soup. That takes twenty minutes to prepare, and I figured that as a good travel blogger, I should sample Cathay’s “snack” service and report back! I got back to listening to podcasts and relaxing while I waited for my soup. I also marveled at the fact that our son was still sleeping. KNOCK ON WOOD. My soup came out, and for snack service, I felt that the presentation factor was quite high. I dumped as much chili sauce in there as possible, and I opened up my chop sticks. I’m not sure why I expected them to be throwaway chopsticks, but I was impressed to see a high quality wooden chopstick set. The soup was delicious! It was way better than the good steak I had for dinner. Furthermore, there were a LOT of wontons in there. Sometimes restaurants will skip on the wontons , but not Cathay. I killed the soup, and I took a quick stroll around the business class cabin. Speaking of cabins, let’s talk lavatories. The lav in the front of the plane is MUCH nicer than the one in the middle. Check out the comparisons pics. I’m sure someone will be able to tell me why, but I’m guessing that maybe this plane had a first class cabin once, as the first lavatory looks a lot more like a first class lavatory. I promise I used a changing pad for the diaper change! Need to change some diapers? Both lavatories have you covered. While the lavatory in the middle of the cabin isn’t as nice as the one in the front, it is larger. It has a dedicated changing table, and you can technically sit on the toilet while pulling the changing table down. I’m not sure why you would want to do that, but I mention it only because that isn’t possible with the first class lavatory. In first class, there’s a very large bench, and it folds down over the toilet. We ended up using the middle lav way more, as it was right next to our seats. I went back to my seat, and I dozed off to sleep again. When I awoke, I looked at the little remote monitor to my left. Wow. Less than five hours left to Hong Kong. My wife and baby were still sleeping – great! Right as I finished this observation, I looked up at the bassinet, and I saw some stirring. I got up and walked over next to it, watching Zach to see what his next move might be. To my surprise, he found his pacifier on his own, put it back in his mouth, and stirred for a while before going back to sleep. An hour later, we hit some turbulence. I mention this because the seatbelt sign got turned on. When the seatbelt sign goes on, no babies are allowed in the bassinet. I had dozed off to sleep, and the flight attendant woke me up to get Zachary. Nooooo! Waking the baby! I got lucky here. Somehow I was able to grab him, put the lasso seatbelt extension on him, and have him fall back asleep on me. We both slept for another hour, and we woke up around the same time as Katy. With just a couple hours left in the flight, Cathay did a dinner service. I got the fish, which was quite good. Katy couldn’t decide, and I actually recommended that she just get the shrimp wonton soup i had earlier for snack service. She got that, and she really liked it! Dinner wrapped up with mango mousse cake and raspberry coulis. I thought it was a pretty darn good piece of cake. We touched down shortly in Hong Kong. The first long-haul flight with the baby was a success! Katy was well rested. The baby was well rested too! I mean… happy wife, happy baby, happy life, right? I didn’t get the chance to interview my son about how his completely flat bed was for his first transpacific flight, but given how he looked with his mama when we landed, I’m guessing he was a fan! That turned out way better than I expected! All three of us were well rested and excited to be in Hong Kong. What a GREAT usage of 50K x 2 Alaska Airlines miles! After this experience, I really look forward to my next trip on Cathay Pacific Business class. It’s not over the top. It won’t blow your mind, but the seat is fantastic, the food is really good, and the flight attendants are friendly and helpful. If you’re looking to book a trip with a baby, I totally recommend booking them. Don’t forget to make sure the infant has a ticket. You need to call the airline to reserve the bassinet! This flight marked the beginning of our travels around Asia and Hawaii. The journey continues!